A productive offense and exceptional pitching has launched Delta College baseball to an undefeated start through three games. 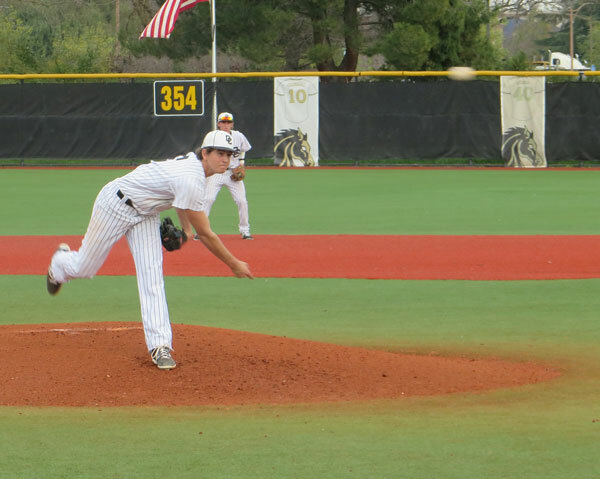 Early on, the Mustangs have shown the ability to utilize their pitching depth to keep the opposing offense at bay. Coming into the 2015 campaign, the Mustangs will be relying on the new pitching staff and solid defense. “Pretty young on the mound, but really deep,” followed with “going to be up to playing defense,” said Head Coach Reed Peters as he described his team. The pitching staff is comprised of 10 freshman and two sophomores. In order to counter the pitching youth, the middle of the defense is critical, specifically catcher Collin Theroux. After three games, the Oklahoma State commit showed his abilities at the plate and behind the plate, ushering his pitchers out of numerous situations with runners in scoring position. He has drove in three runs and has crossed the plate five times himself. Being in his second year on the team, the catcher is eager to help the Mustangs win the title this year after coming up just short last year. “Whatever I can do to help the team win, and succeed, and win a state championship,” said Theroux. Theroux noted the importance of having the support of Delta students. “We’re a team that feeds off energy, and when we have a big crowd out here, a lot of fans for us, we feed off that, it would be awesome to get people out here,” he said. “We’re an exciting team, we’re fun to come out and watch, we have a lot of talent, we’re [going to] win a lot of ball games,” added Theroux. That’s what makes the team exciting to watch, according to Peters. “We’ve established a good tradition, players have a chance to play at the pro level,” said Peters.